Step 1: Diagnose and repair the cabling. a. Examine the Addressing Table to determine the location of the all connections. b. Verify cables are connected as specified. c. Diagnose and repair any inactive interfaces. Diagnose and repair any inactive interfaces. Step 1: Examine and set clock rates on the DCE equipment. 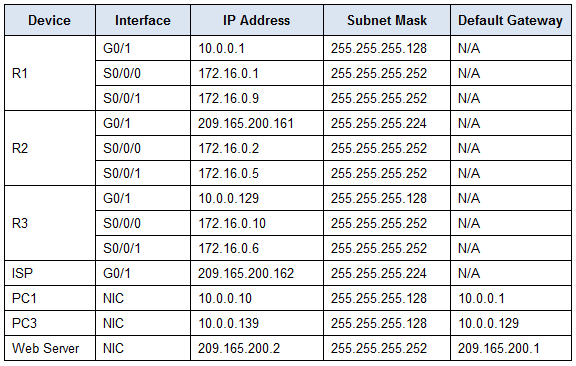 Examine the configuration of each router to verify that a clock rate has been set on appropriate interfaces. Set the clock rate of any serial interfaces that requires it. Step 2: Examine the encapsulation on the DCE equipment. All of the serial interfaces should be using PPP as the encapsulation type. Change the encapsulation type to PPP for any interface that is set otherwise. Step 3: Examine and set CHAP usernames and passwords. Examine each link to verify that routers are logging into each other correctly. All CHAP passwords are set to cisco. Use the debug ppp authentication command if needed. Correct or set any usernames and passwords that need it. Step 1: Verify the IP addressing. 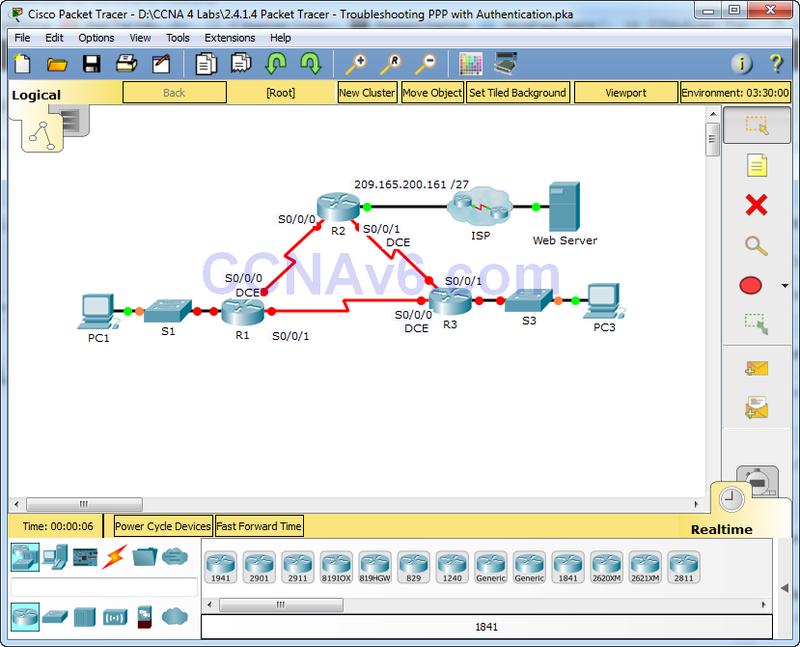 Check IP addresses against the Addressing Table and ensure that they are in the correct subnet with their connecting interface. Correct any IP addresses that overlap, are on the wrong interface, have the wrong subnet address, or are set to the host or broadcast address. Step 2: Verify full connectivity by tracing a path from PC1 and PC3 to the web server.